Apple has just updated its developer website for the iOS App Store to show the distribution of devices on different versions of iOS, and iOS 7 now commands a significant league, with 74 percent of devices using the major overhaul released alongside the iPhone 5s and iPhone 5c in September. 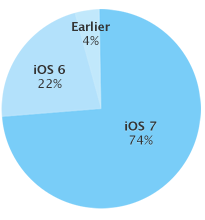 iOS 7 usage has increased 10 percent since October according to Apple’s numbers, which is remarkable growth especially given the drastic nature of the changes in this update, which includes a complete visual overhaul of all OS elements. Even more impressive is the fact that another 22 percent of active App Store users are running iOS 6, which means that together, a full 96 percent of iOS customers are running just the two most recent versions of the mobile OS, while Android still has a much more scattered distribution. That kind of traction is great news for developers, since they can target the vast majority of active iOS users with less effort than if that distribution reflected earlier versions of the OS. In the case of iOS 7 specifically, however, since it’s so different from older versions of iOS, getting just about everyone into that big bucket of current version users becomes even more important. Outside firms are seeing similar adoption rates, with Chitika noting in a recent study that over 70 percent of traffic on iPhone and iPad in North America is coming from iOS 7 on its network. That means uptake is happening at a much quicker pace than it did with iOS 6, which took half a year to reach 83 percent, so apps targeting iOS 7 only likely have little to fear in terms of limiting their user pool.